There are two types of twins: Dizygotic (binovular or fraternal) and Monozygotic (uniovular or identical). Twin males are most common while a boy girl combination are less common and twin girls least common. There have been suggestions of a third type of twin which is uniovular, but dispermatic and thus “half- identical,” because of a precursor to the true ovum splitting and being fertilized by two different sperm.1 One such set of twins occur in every 80 births. Writing in Newsweek magazine, Sharon Begley states, “Many a lonely adolescent has fantasized a lost twin somewhere, the perfect companion, confidant and soul mate- other self.” Twins make up only about 2% of the population. But wait, Ms. Begley continues: “One of the more provocative recent discoveries about twins is that many more are conceived than are born- a phenomenon called Vanishing Twin Syndrome (VTS)2. Some sonogram studies indicate that up to 78% of pregnancies that start with two fetuses end up with only one by about the 5th month. 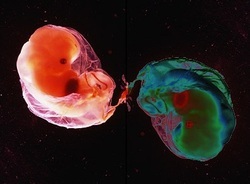 A fetus can vanish when its gestational sac is reabsorbed by the mother, for reasons that no one understands.” It is speculated that it may relate to the mothers’ inability to carry multiple fetuses to full term as a result of biological deficiencies. In up to78% of the sibling twin conceptions, one twin does not make it! If correct, this means the conception of twins is five times more common than the birth of twins. So the regular occurrence of Vanishing Twins found in various emotional therapies including NET may have some basis in fact rather than be considered an Emotional Reality or perhaps a fantasized event. The Vanishing Twin Syndrome, rather than be considered as imaginary, may indeed have statistical basis. Survivor Guilt, along with Failed Savior Syndrome, Haunted Womb Syndrome and other relationship mechanics, is now understandable. As with any relationship involving a Neuro-Emotional Complex, the mechanics are the same but because of the closeness of the twins, especially identical twins, the physiology of the emotional impact is considerably higher. 2 Vanishing Twin Syndrome (VTS) is an obstetrics term, referring to the actual vanishing fetus. It has been loosely used as “shop talk” when referring to the Emotional Reality physiological paradigm.